When Roberta was infected with a curse, she never realised the hidden world that was waiting for her. Ridgewood was a quiet and slumbering town, but it seemed there was a great menace waiting in every shadow. With the initial horror having been abated, Roberta’s been cast into an alternate reality where it’s quickly apparent forces of doppelgangers are waiting to break through to Earth. But Roberta’s not alone, and there are many friends left behind who are still fighting. 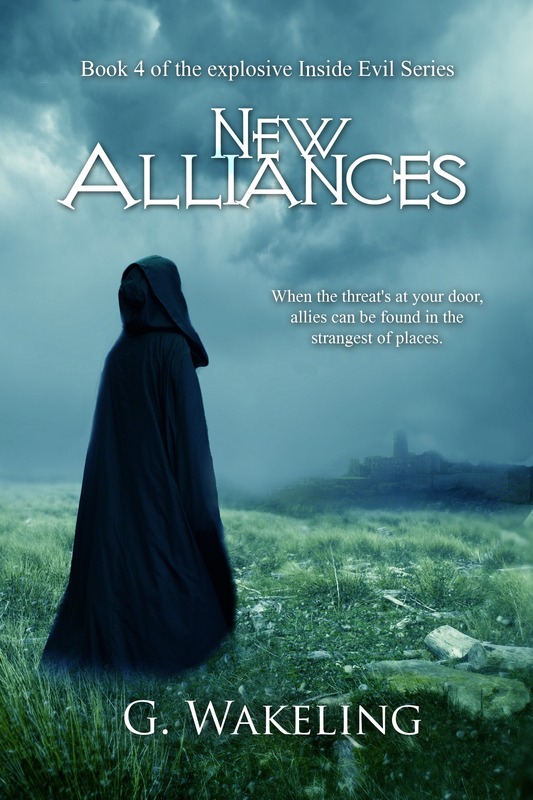 Whilst the gatekeepers fight to uncover secrets and develop a plan to protect themselves, new alliances are forged. And, with new and unexpected allegiances created, the protectors of Earth are finally realising that they’re not defending themselves against a one-sided war. Another scream rang out in the darkness and Roberta pushed her hands tighter over her ears. The torturing had been going on for hours. The cries had been sharp and prolonged at first, until they gradually quietened to a muffled and dull whimper. Then they’d stopped, and she’d been relieved that the horrendous sounds were no longer eviscerating her ears. But it seemed the victim had only been given a slight respite, for another painful onslaught was soon brought upon them. Roberta had quickly realised just where in Gathin she’d been thrust into. Through the opening at the top of the tall cylindrical tomb a light shone down upon her. But it was not the blue sky she originally thought, but a mural painted on a ceiling far above. The drop from the high room to where she lay now was vast. As someone had been dragged across the floor and propped into the chair that now covered the small spherical opening above her, Roberta had realised she was in Gathin’s central tower. It was the windowless pillar that rose out of the ground in the heart of the Queen’s domain. Above her was the room where she’d fought off the Queen of the North Realms, where she’d attempted to throw the doppelgänger to her death. The small opening was covered with an iron grate; the only barrier that kept the seat from dropping into the chasm below. As Roberta had surveyed the room, she’d realised that things, creatures…..people, were dropped from that height, for there was a mound of corpses in the room in which she was now trapped. They rose towards the middle like a newly forming mountain, the peak of which was directly beneath the opening above. Looking into the darkness with the vague hope that she might’ve gained the sudden ability of nocturnal vision, Roberta picked out the top of the mound, the place where she’d found herself sprawled only hours ago. Perhaps it was days? She couldn’t be sure. The desiccated and mummified rat corpses that littered the floor of the room in their thousands, made Roberta’s skin crawl. She allowed herself, just momentarily, to remember that her sister’s body also lay amidst the mound, Natasha’s sunken face being dry and lifeless. But she shouldn’t jump to conclusions. It might not be Natasha, it must be her sister’s doppelgänger. It had to be. Now, Roberta was huddled against the outer wall of the circular room trying to shut out the sounds that came from above her. A thin layer of dead rats shifted as she moved, and though she’d managed to clear away many of them with her feet, a few rogue skeletons still creaked beneath her as she sat in resigned devastation. She’d fumbled her way through the dark as her fingers traced the rough stonework of her tomb, but she’d found no way out other than the obvious; a large impenetrable door that was solidly locked. At one point there’d been noise beyond, thick gravelly voices and then a deep snarl that could only have come from one of Gathin’s gigantic wolves. If she stayed in this room, she was dead. But if she alerted anyone that she was here…..it would be worse. A scream rang out again, causing Roberta to look towards the grate and push her fingers even deeper into her ears. The voice wrenched Roberta’s gut as she recognised it as her own. The woman she sought to kill was almost directly above her, but yet so far out of reach. There was a small shriek of fear, and the man’s voice was cut short. Roberta drew her eyes to the floor as she saw a shadow fall still upon the grate. There was the sound of light rain, as if a sparse cloud was fluttering overhead and giving the land below a moist dusting. She knew the rain was crimson, that it splashed the mound of carcasses at the base of the tower with scarlet. The trickling ceased to be heard as a deafening roar echoed around her, and for a moment, Roberta twisted her head anxiously towards the small door, expecting it to open with a loud crunch. Movement at the top of the tower momentarily plunged her into complete darkness, until the roar was heard again and the grate was pulled back into place. Seconds later there was a sickening crunch as the tortured soul’s lifeless body from above was reunited with its lost blood. It landed on top of the mound with a thud, scattering rat carcasses and drawing the few live rodents on the edge of the room scuttling towards the centre for their newest meal. Roberta wasn’t sure what drew her towards the body. Perhaps it was the morbid curiosity of seeing just what had been done to the man. Alternatively it was simply the chance to actually move with purpose from where she’d been stagnating in the darkness. Her fingers touched a revolting rat as she crept on her hands and knees towards the top of the mound, her only relief coming from the fact that the rodents she felt beneath her fingers were dead and not the living carnivores that seemed to have their beady black eyes upon her as an extra meal. She felt something wet on her fingers as she placed her hand down upon the gnarly head of one particularly gigantic creature. In the dark light it seemed little more than black goo on her hands, but as her eyes squinted to try and determine just what the viscous liquid smeared across her fingers was, she saw that the sound of rain had indeed been the splatter of a life force draining away. Despite appearing dark and black upon her fingers, she knew it was the scarlet ink of life. After a brief attempt to wipe the blood from her hand, Roberta leant forward and tried to inspect the fallen figure. He’d dropped in such a way that he was sprawled on top of the heap, his arms laying at abnormal angles. His body was contorted and crushed by the severity of the fall, a limp wrist lying lifelessly before her. Such was the keenness of her eyes and the length of time that she’d been trapped in the dark, that Roberta found the light around her to be enough to perceive a diagram on the man’s wrist. She recognised it instantly, for it was the same symbol that Galdur had etched on his chest; the Ammokra. But Galdur, Roberta’s Icelandic gatekeeper, wore it to symbolise his part in keeping the dark from their door, to stop the curse breaking through to Earth and causing complete and utter devastation. Why should someone in Gathin have the Ammokra so carefully inked upon their skin? The man wore a long robe, the hood of which was covered in silver threading and feathers. A priest, perhaps? A Gathin man who wielded the curse that came to Earth every decade? Roberta couldn’t be sure, but he’d known something. Or, at least her doppelgänger had perceived that he’d held information important to her quest. As blackness became her constant, a never-ending night, Roberta froze as she heard voices. They were deep; the grumbling of men, a sound that echoed through the tower’s many subterranean corridors and floated through the small grate in the door. They were not words meant to strike fear but sounded more like the heavy and irritable growl of souls who seemed to have contempt for the world around them, but they caused every fibre of Roberta’s being to grind to an immediate stop lest they hear her. The voices were not immediately outside the door, but way off down the tiny stone hallway, and though the fading footsteps showed no obvious threat of turning and heading back in her direction, Roberta realised that if she was to have any hope of surviving, she had to find a way out. Waiting until the voices faded completely from earshot, she breathed a heavy sigh and attempted to pull her thoughts together. She was in a small circular stone tower. There was no way out other than a vastly thick door, and the only hole was a small slit where it didn’t quite reach the floor. Even though her fingers were slight, there was nothing to be done to get at the lock on the other side. High above, far out of reach, the single grate shone the slightest of illuminations into her cell, and scuttling around the edges were the rats who must be finding their way into the room through the small ground level grate. Roberta had held her hand to it upon her first circuit of the room and found it to be hot. The only conclusion she’d come to was that it was a funnel from the furnace, a way to push warmth up the tall tower and heat the cold rooms above that protruded high into the sky. It also accounted for the dry atmosphere that caused the corpses around her to mummify rather than rot into a sludgy hell. Pushing herself down the heap, and momentarily realising that she was becoming used to the texture of corpses beneath her fingers – a fact which made her shudder more than the death around her – Roberta was quickly at the grate. When she’d first entered the tomb, her fingers had recoiled at the touch of warped and leathery heads, sharp and bony teeth. But now they dug into the bodies without concern. The hope in her chest rose as she realised that the grate was far more than a small sliver at the bottom of the room, but was deeper than she’d imagined, hidden beneath layer upon layer of rat. She threw corpses over her shoulder without concern, pushing mounds of spindly tails and flaking fur out of the way as she dug deeper into the pile before her. Within a few moments, the grate in the wall had emerged to be far greater than she had even dared hope. It was big enough for her to slide through, albeit on her stomach, but it was the one and only way out. Placing her fingers carefully through the small holes on the barrier, Roberta gripped the metal carefully and gave it an almighty wrench. Nothing moved, not even the slightest jiggle that the needle of hope in her chest could get behind. She pulled again, still nothing. The metal grate didn’t budge in the slightest, and Roberta feared she might’ve given too much over to the hope she’d escape the dark dungeon. She pulled her fingers from the metal and traced around the edge of the grate, looking for a crack, a weakness that she could take advantage of. There was none, but her fingers touched the outline of a screw and she dared to become excited again. By now, her surroundings were of little consequence and she reached down to one of the decaying corpses, felt carefully along the brow of the rodent and then, with a swift crunch, broke one of the grossly long incisors from its skull. Attempting to unwind a single screw was extremely hard going, and several times Roberta had to stop as voices floated through the darkness. Behind her, there were the sounds of rats gorging on the fallen victim, incisors similar to the one in her hand, gnawing and chewing on fresh flesh. Only the very tip of the tooth was any good to her plight, and the darkness and the fact that the bone continuously slipped out of the screw’s groove, caused Roberta to curse in the darkness. But, eventually, the screw became so loose that her nimble fingers were able to pull the fastening from the metal and the grate slipped on one side, making a muffled thud as it fell away. Roberta wasted no time in attacking the remaining screw in the opposite corner, the last fastening that prevented her from sliding into the horizontal shaft. It seemed easier this time, and whether it was the screw and tooth combination, or the increased urgency, the grate came away from the wall in no time at all. Taking a moment to peer into the black void in front of her, Roberta wondered what lurked in the darkness. She placed a hand upon the inner side of the vent and felt warmth on the metal, nothing so hot that it scorched her skin, but the soft warmth as if a towel had been hung on a bathroom radiator. The exertion in the cell had caused Roberta’s hair to fall around her shoulders, and she scraped it back into a tight pony tail before dropping to her stomach and slithering into the vent. She inched forward several metres before realising that she didn’t want to alert anyone to her presence, and though contortion had never been her strong suit, she managed to twist herself around enough to pull the vent back into place. It wasn’t precise and she couldn’t replace the fallen screws, but it should evade being noticed for a while. Inching through the vent was almost as painfully slow as removing the first screw had been. The tiny metal shaft was hideously small, a suffocating hot and grimy environment that made Roberta feel as if she was being suffocated from every angle. Her arms continuously smashed into her chin, and on the rare occasion where she managed to flick her head away in time, she simply banged into the top of the funnel instead. Every knock sent a low thudding sound flowing through the duct, and though the echo quickly died, Roberta began to increasingly fear that her stumbling around in the shaft would wake the entire tower. After what seemed like forever, a time during which she wondered on several occasions whether she’d made the correct decision to venture into the hot air system, Roberta realised that the funnel had widened slightly. The knocks and bumps were becoming less common, not because she was more adept at navigating the maze, but because the space through which she slithered was larger than before. The metal beneath her fingers was becoming hotter, and providing that she wasn’t singed to death, there was the hope that she was nearing the furnace, coming to a possible place where she could escape the confines of this venting system and actually have room to stretch out. Room to attack if she needed to. The metal creaked as she slithered forwards in the shaft, aware that her surroundings were quickly becoming too warm to deal with. There was something ahead of her, a break in the black surroundings on the floor of the vent through which she crept. The hole became more obvious as she dragged herself along, and soon Roberta saw that the opening was a small grate looking into a room below. There was no getting through it; it was far too small. But it brought a slight sense of relief that somewhere, in this maze of metal, there’d be somewhere to escape. Dropping her head so that she could peer through the small window, Roberta realised that she must be close to the furnace. From the little she could see, the room below looked to be a storage facility for a vast number of metal canisters. There was another funnel dropping from the ceiling on the other side of the room, underneath which was an expanse of cushioned flooring to protect whatever fell from the heavens. As was usual with Gathin, there also seemed to be the grisly signs of death, with dark stains on both the floor and wall indicating that something, or someone, had had their blood spilled in the vicinity. Roberta shuddered; at least it wasn’t her own – yet. As she was about to pull herself away from the grate and find one that was actually big enough to crawl through, Roberta froze. From below her came a deep rumble as if an earthquake was slowly erupting from under her very feet. A nose twitched and a huge hairy and black muzzle stalked into sight. Roberta ceased even breathing as she saw the nostrils below her sniff the air as if they knew she was there. The enormous hulk of Luguolo filled the room beneath her, the thin mohawk of ebony coloured fur that ran along his back, upright and bristling in the dry air. He could tell she was there, she knew it. But he didn’t look up, he just stood transfixed to the spot as a drop of moisture pooled on the end of his quivering nose and fell to the floor. From where she hung above him, Luguolo’s fearsome orange eyes were hidden, but she’d seen them devouring her before and knew he was preparing for a fight. Then, content that he’d surveyed the room and found it empty, he turned slowly and padded away, his tail almost brushing the very grate upon which Roberta lay as he did so. It was several minutes before Roberta even dared move for she feared that Luguolo had simply sauntered out of sight and was now quietly crouched outside the room, awaiting his prey to stir. As she tried to regulate her heaving lungs and prevent an obvious gasp escaping her lips, she was aware of distant voices. They became gradually closer, accompanied by an odd clunking, until two men trundled into the room with an ancient wheelbarrow that looked on its last legs. “Ain’t your concern,” the other warned as he held the barrow firmly whilst the canister was thrown in. The man heaving the heavy metal cans stopped what he was doing and looked up warily at his companion. After heaving one final canister into the barrow, the two men disappeared from Roberta’s sight, though the sound of them trundling along the stone corridor lingered in the air for some time. She wasn’t sure who she was more worried about; Luguolo or her own doppelgänger, The Queen of the North Realms. But there wasn’t time to pause for thought as she was keenly aware she was far from escaping and saving herself. Why did you put me here? She cursed the spirits of the Middlelands yet again for putting her in such a position. Surely a small and secluded lodge somewhere in the woods would have been a far better starting point? With realisation that the metal beneath where she’d lain for several minutes had becoming increasingly hot, Roberta took a deep breath and forged ahead. She gave in to the risk that those wandering the tunnels below might hear her, and dragged her tired and aching frame through the network of funnels and tubes with the desperate hope that an exit could be found. The metal had become cooler than before, and she wondered whether the two men she’d seen had lapsed in their stoking responsibilities. That, or she’d actually bypassed the furnace completely. It seemed like hours later, but must’ve only been thirty minutes at most, when Roberta slithered around a particularly tight junction in the vent system and saw an opening ahead. It was larger than the previous grate had been, possibly wide enough to drop through, but what really caused hope to swell in Roberta’s chest was the fact that there was a dull glow emanating through it. It was one thing to navigate a maze of metal furnace vents, it was quite another to find a way out when, aside from the tiny occasional opening, there was no light at all. Here, as she edged closer and saw that the gaps within the vent were smaller than usual and more like bars, at least illumination was finally brought into her world. Peering through the narrow slits into the room below, Roberta saw that she was hanging above a small square room with a taller than average ceiling. A faint glow emanated from an oil lamp pushed into one corner, the flame casting shadows across a collection of ancient and dirty chains that were securely attached to the wall. Beside one of the rusty metal fastenings, there were blood-covered and lifeless fingers. Roberta’s eyes scanned a hand and followed an arm to where a figure with long hair was collapsed on the floor, the legs pulled into a foetal position. When will the final Inside Evil book be released?